As the housing market crashed a decade ago, new home prices began to push above resale prices. Then they pushed and pushed and pushed some more. A pricing crack became a pricing canyon. Long term, the new home median price has been mostly 10%–20% above the existing home median since 1990 (see below). 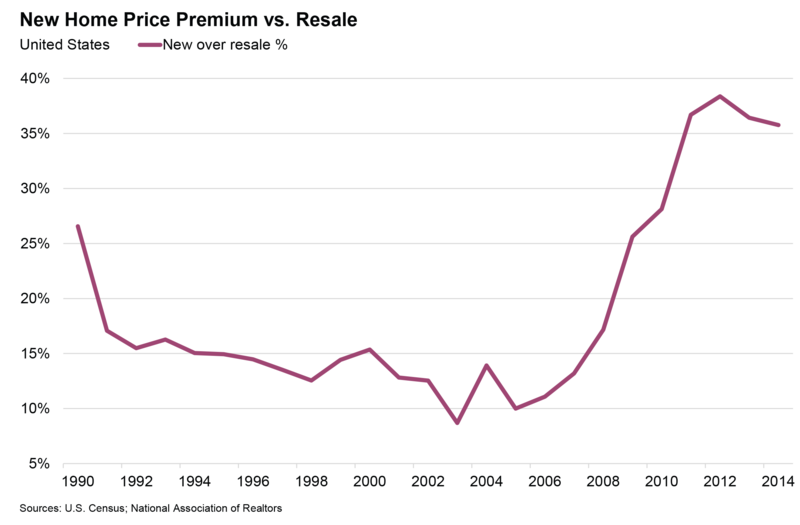 Since 2011, however, new home prices have been at a 35%–40% premium over resale prices. 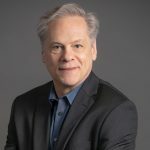 While the exact percentages aren’t perfect due to “apples and oranges” comparisons, our consultants have been confirming for years that new home sales have been slowed by larger than usual new home premiums. But over the last two or three years, we began to see a trend. When we update a feasibility analysis, we often look at market movement. 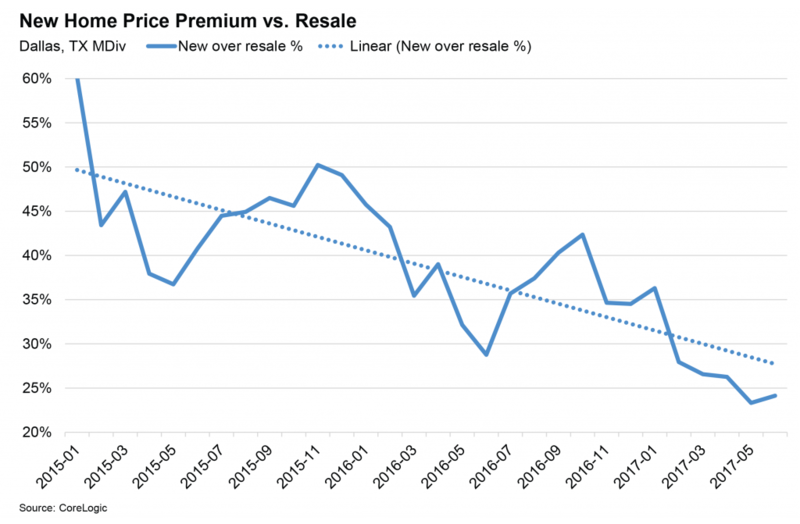 That is, if it has been six months since our last study, we will examine price change among resales and new home comparables over that period. 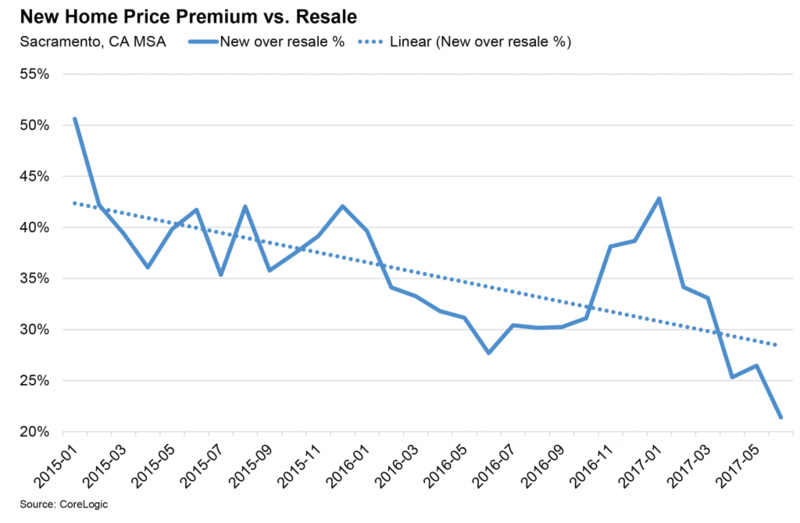 We look at a trailing 12 months of data for resales from identical geographies and product niches and assess identical plans among new home communities available at both Time 1 and Time 2. Over a six-month period in the Natomas area of Sacramento, resale pricing rose 3.5%, while new home pricing increased 2.6%. In a year in Tracy (East of the Bay Area in California), resale pricing rose 6.2%, and new home prices rose 5.4%. Over ten months in Sonoma County, resales experienced a 6.2% pop, while new homes moved up 5.1%. Over a brief four-month period in Fremont (a suburb to nearby Silicon Valley), resales increased 1.3%, while new home pricing actually shrank 0.5%. These aren’t overly dramatic differences, but the differential rates of change have been consistent, across various regions and submarkets and at various price niches. And it’s not just in Northern California. The graphs below show the difference between the new home median price and the resale median price in Sacramento, Phoenix, Dallas, and Atlanta—and our consultants in those markets confirm the same trends. 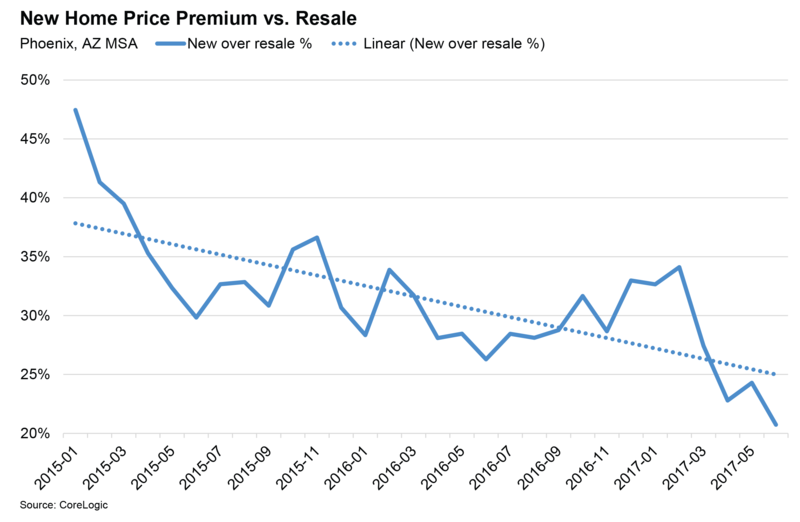 The trends are clear: resale pricing has been slowly closing the gap over the past two and a half years. Indeed, this is a national phenomenon. Over the same 2.5-year period shown in the MSA charts above, the national chart below shows the shrinking of the new-resale price gap. Do we expect this trend to continue? Absolutely. This is what should be happening. 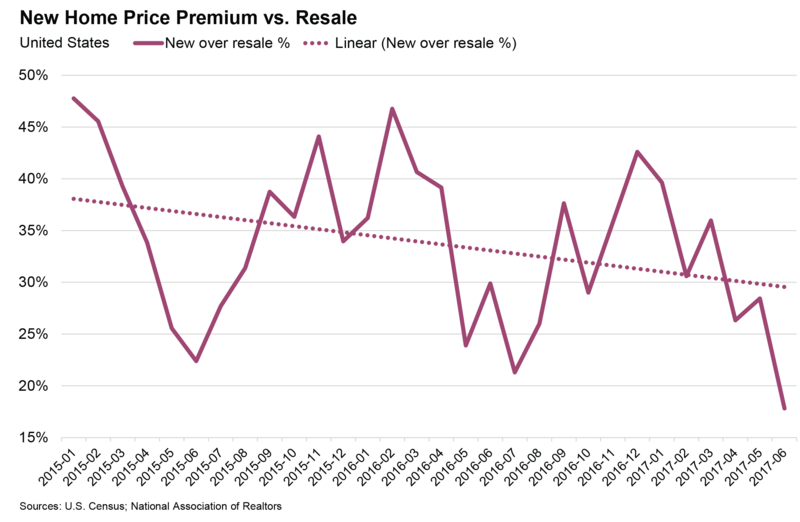 The current new-resale national price gap of 35% (full year 2016) is still well above the norm. The fact that this gap has closed gradually and in fits and starts indicates that the going may be slow, but the trend will likely be here for a while. What does this mean for the new home sector? 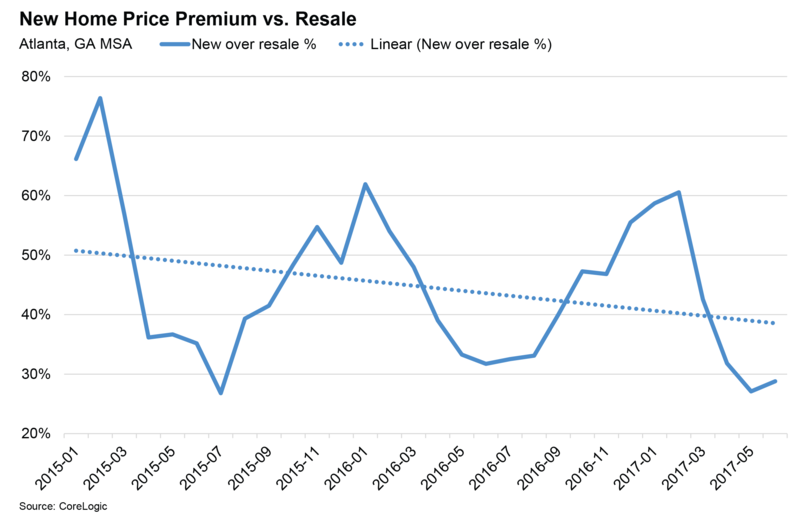 For one, it means stronger resale pricing could bolster new home pricing as the pull factor of a low-priced resale is less dramatic. (Though limited existing inventory makes that option illusory in many markets.) It will also aid contingency buyers, help pull more buyers from an underwater loan to free them up to buy a new home, and improve equity positions. To be clear, this is a good thing. A gradual movement of the new home premium back toward its norm is better than something more volatile. That this gap is being closed more by a strengthening resale market than a weakening new home market signals a stronger overall housing market, and that is a win-win.